If you ask Vincent Kinne how he met his fiancée and business partner Mindy, all he has to do is look up at the inviting old-school neon sign above his restaurant. Met Her at a Bar, a new neighborhood coffee and waffle bar in the Miracle Mile, is operated by the engaged duo – and Mindy even makes the waffles. As the name proclaims, they met at a bar in Los Angeles. The friendly café on the corner of Eighth and La Brea serves great coffee and eye-opening breakfast fare in a welcoming, trendy atmosphere. Little touches, like the reclaimed wood communal table and large, close-up photographs of smiling people from around the world, add to the restaurant’s charm. Food is plated on an assortment of unique dishes including wooden boards, and iced beverages are delivered in large stemless bulbs. Met Her at a Bar’s menu expands on the restaurant’s whimsy with tongue-in-cheek names for dishes, like the “Everytime I see you, you Avocado Toast me.” This rendition of the brunch staple is served open-faced with tomato and parmesan on organic sourdough. The clean flavors are elevated by high quality ingredients. Or perhaps you’ll enjoy the “Well hello there, beautiful Power Bowl” with kale, quinoa, cranberries, almonds and topped with a poached egg. Mindy’s specialty waffles will make you “Wake Up Happy” when you enjoy the namesake dish that includes scrambled eggs, bacon, sausage, homemade maple whipped butter and, of course, a waffle. 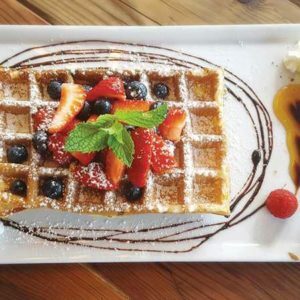 Or try a sweet Belgium waffle with berries, known as the “Can I see you again.” You’ll definitely want to revisit this dish. Lunch items include a terrific “Hey you turkey sandwich” piled high with smoked turkey, cheese, tomato, cranberries, organic greens and a dab of Dijon mustard. Or kick it up a notch and order the “Oh no you didn’t” Sriracha turkey waffle sandwich. The comfortable, lively environment enhances the tasty, high quality food. Kinne personally welcomes his guests and crafts the delicious lattes and cappuccinos. His relaxed demeanor makes guests feel like they’re being hosted at the couple’s home. The eclectic, cozy space is completed with a piano sitting in the corner, asking for someone to play. Bring your laptop and work on your screenplay while enjoying a leisurely breakfast and top-notch coffee or get a group together to debrief the weekend over Sunday morning brunch. Vinnie and Mindy will be glad they met you … at their coffee and waffle bar. 759 S. La Brea Ave. Open daily from 8 a.m. to 3 p.m.